Kirk Lorange has been playing for 50 plus years and is one of Australia's best know session and performing guitarists. He regularly contributes articles that help guitar players of all skill levels to play better and to better understand their instrument. On Plane Talk he reveals the visualization technique he developed as a non-reader. PlaneTalk is a comic-strip conversation that takes place on a plane between a seasoned guitarist and a guy who gave up trying to figure it out. The pro lets him in on a secret, a shorthand way of thinking of music and the guitar, a simple trick. The reader gets to listen in as the lesson unfolds. Here is a Sample Comic Strip. Following on from his popular articles above, Kirk has added a crash course in Drop D slide guitar to his site. How to Play Guitar and Sing at the Same Time This has some good advice for both singers taking up the guitar, and guitarists learning to sing. Chords, Chord, Chords! chord theory & links to all the best chord sites! How Guitars Work - The guitar is one of the most popular musical instruments in use today. Now you can understand how both acoustic and electric guitars work, from the soundbox to the frets! Guitar Lesson World - A site that you can obtain Guitar Lessons on all styles and all levels. This site is a resource that gives the information that aspiring guitarists need to become better. It provides lessons on theory with everything from scales and modes to chord construction. Play Guitar free online tuition - a graduated way to learn how to play guitar in an easy and direct way, with a guitar teacher or by self-instruction, step by step. Coach's Corner - Feature articles include: "Abstraction vs Reality" "Memorizing Your Music" "Arranging & Transcribing" "Message in Your Music" "Essentials for Evolution" "Music as a Language" "Establishing Priorities" "Music as Your Career" "Fingerpick vs Flatpick" "Organizing Your Time" "Fusion or (Con)Fusion" "Practice Can Make Perfect" "Guitar & Electric Bass"
Vision Music - "Offering the highest level of professional music lessons for the evolving guitarist or bassist. I've taught music full-time for over twenty-six years, and have put my heart and soul into what many believe is the finest music instruction site on the web!" - Mark Stefani. 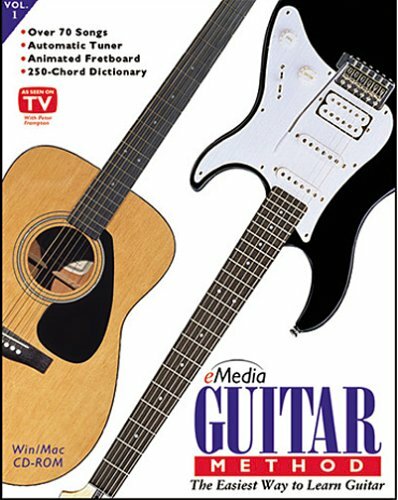 eMedia Guitar Method 1 Complete CD-ROM guitar tutorial package with 60 comprehensive lessons, ideal for the beginning guitarist. No previous music experience is needed for this fun way to learn acoustic or electric guitar at your own pace. The lessons include over 100 songs and exercises and range from basics like stringing the guitar to playing chords, melodies and fingerpicking. Complemented by over 30 videos and over 3 hours of audio from guitar instructor / national performer Kevin Garry, the title offers a better alternative to expensive lessons and hard-to-follow books. eMedia Guitar Method 2 takes your playing to the next level. In 60 more video-enhanced lessons for the intermediate or advanced player, learn popular songs and licks with intermediate-level skills such as hammer-ons, pull-offs, bends, vibrato and barre chords. The rhythm section illustrates different strumming styles and the fingerstyle section teaches new playing techniques. You also learn about reading music, scales and modes. A variety of music styles is covered and you can choose between tablature or standard music notation. Metal Method Video Guitar Lessons - Try the videos which can be found here, especially the classic rock series. There are also online MIDI segments and an opportunity to win a free video every week. Guitarology - The essential online learning resource! This website has got it all: +65 free lessons, +200 chord charts, +250 scale charts, +25 000 tabluature files, resources and more! Specifically, it is aimed at those wishing to improve their playing, but there is certainly something here for everyone. Serious Guitar Instruction Book - Instruction for the serious guitar student. Understand all styles of music by learning theory you can use. Comprehensive, detailed study of scales, chords, chord progressions, Keys, harmony, and how to improvise. 200 page book containing a lifetime of information and ideas. Guitar Made Simple - Wilson's guitar lessons and instruction book contain mostly guitar chord diagrams and music scales, which you can use as a reference guide. Nashville Guitar Pattern - "We are selling musical instructions books. We have an innovative new book series out for guitar, bass, mandolin, violin, and viola that allow the user to create hundreds of scales and modes using only one single visual fret pattern. This information has never before been published..."
Darius' Umbilical Chords - A great tool for teaching - a must for all serious musicians. Chops from Hell - Shred Guitar? Lots of tuition here, Networked Guitar Chat & even instructional books for sale. Chord Wizard - Download & see what you think! ChordWizard is a new generation software tool that brings the dynamic world of chords to the players of guitar, banjo, mandolin and ukulele, presenting it in terms of chordshapes - the patterns of fingers on frets that are the basis of music on these instruments. Charanga - Presenting 'Guitar Coach', the phenomenal new CD-rom guitar tutor for beginners, especially commissioned video, audio and graphics integrated to provide enjoyable and effective guitar lessons.